Materially, black is a pawn up. White's rooks and bishop are active. White has potential counterplay on Black's Kingside but I think it can be defended by the move Ng6. According to my analysis, the position is quite equal and I don't find any reasonable justification for stockfish's score. Can you please explain why does stockfish prefer white here? The key is to see how quickly both sides can bring their pieces into the game. Only Black's Queen and Knight are active -- his Bishop and two Rooks are extremely passive and can only be activated after many moves. Meanwhile, White's Rh2 is active and he can bring Ra1 into the game in one move (by playing Rg1). Qc2 seems passive, but it can be opened quickly by playing d4, and maybe even a pawn sac with e5. White can bring the Knight into the game by playing Nf3, and the Bishop can be activated on the same diagonal as the Queen, after a potential pawn sac with e5. Also, notice how by playing d4, White drives away one of Black's two active pieces. As an extra bonus, d4 also gives White full control of the center, and limits Black's Bishop. Based on all this, White has more than enough compensation for the h6-pawn (which can't even move without being taken), but not enough to be winning (just better). The main feature in this position is the lack of defenses around black's king. After Rg1 followed by improving the bishop, either h5 or c4 to pressure f7, you are effectively attacking with an extra rook. 1) Although a beginner's attacking formation, aligning a queen-bishop battery--by d4, Qd3, Bd1-c2, threatens a simple mate on h7. 2) After an exchange sacrifice on g6, the weakness on the white squares are easily exploited after the bishop gets to c4. 3) After the Knight reaches f5, via Nf1-e3, the pressure on g7 and especially h6 is difficult to protect. The knight on g6 is the king's best protector, but, mainly due to it being on a white square, it is easily removed, and then black's kingside becomes exposed. Since this is an opposite-colored bishop game, black has a light squared weakness on both sides, which could lead to an invasion on the light squares from white. Even though White doesn't have any pawns to protect the White King, it does provide semi-open files for the rooks to attack on, and the semi-open files lead straight to the black king. Not the answer you're looking for? 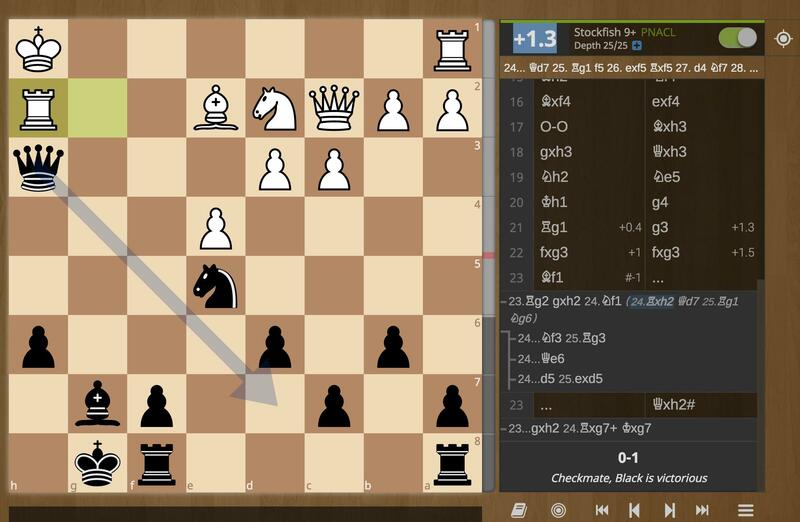 Browse other questions tagged stockfish positional-play or ask your own question. Why does Stockfish website offer many apps to download? analysis of a position - why is my move so bad? Why is Kf8 the recommended move here? Why Stockfish 9 fails to see the draw?